The summer place is old and informal, an unapologetic amalgam. They say it floated once, at flood, and settled a bit closer to town. There is a large map next to the dining table, fixed to the wall at an easy height and surrounded by a frame of thin boards. It bares witness to both tiny hands and hungry insects. Storm surge brought the water up in ’38 and salt preserves everything below the level of my chest, everything higher has been tea-stained by time. Sweet breezes and rain find their way in. One feels thunder through its walls. Sand and toe prints mark a path to the door at the back. Partly used bottles of bug spray and tanning lotion wait on the exposed stud work. It shouts modest among its neighbors. It is a place where we have come to learn that it is true what they say about the best things. Make it do, or do without. As such, and because it makes little sense to do otherwise, retired household items make their way here. To live out still useful lives, weeks at a time. 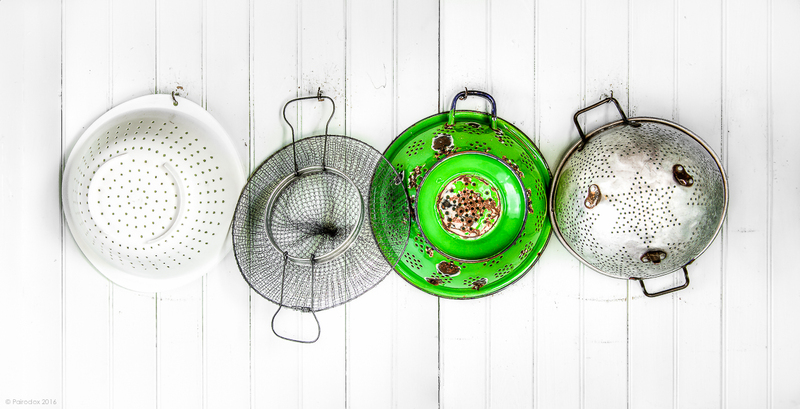 I find it odd that I should look at this image and consider it a family portrait, a genealogy of colanders. Its chronology is, I believe (oldest to youngest, and from the left) 3,4,2,1. If so inclined one could surely arrange any consanguineous group of kitchen implements in a similar way. To close my metaphoric loop, one cannot deny that colanders have changed over the years. I wonder if they have have done so in any predictable way. Surely each allows vegetables to drain equally well. I therefore conclude that change has occurred in no particular or directed way. Perhaps we should recognize that design, in this case, has been influenced by the vagaries of marketing and of materials. In any case, colanders don’t beget colanders. They do not play by Darwinian rules.